THIS IS A SOLID TOP TABLE SURFACE! IT IS NOT “SPLIT” LIKE MOST ALL OTHER BRANDS! Consider purchasing our N110 Block Mats to turn this beautiful table into a Lego/Duplo® compatible table! 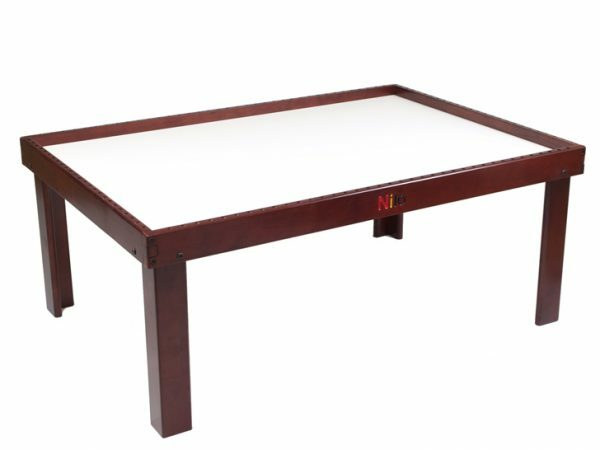 Why choose an Nilo® Activity Table? A few key points here. First, the raised borders are the perfect height, not too low, not too high. As such, they serve to keep manipulative on the table top and off the floor. Next, its the perfect height for wooden train use…the track is 1/2″ thick, our borders are 1 1/4″ high. This allows for 3/4″ of raised border with wooden track being placed on the table. I’ve noticed many tables feature just 1/2″ or 1″ and others feature 2 1/2″ or more! None of these dimensions are ideal in my opinion. Thus, we feel our 1 1/4″ is the best out there. Now, lets talk about how our table is made. Solid, almost 1″ thick hardwood, dado in frame which sandwiches the table top for added strength, solid “L” shaped legs and 1/4″ bolts, 6mm corner screws hold this baby together…for life! 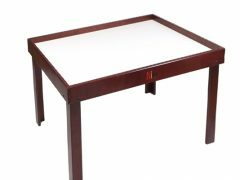 Our regular N51 tables come with the best multi-use surface for a play table, namely, melamine, AND, its “two sided”! If one side gets damaged you can disassemble one end of the table, slide out the top, flip it over and bingo, you have a new table top again! In summary, there isn’t a better made, more versatile Childrens Play Table, Activity Table, Lego Table, Duplo Table, Multi-Use Table on the planet! Buy one today! You’ll be glad you did! Check out our 5 star reviews! Tell your neighborhood Specialty Toy Store about us, should they not carry Nilo! Its a Beautiful Thing!